Today's post in How She Does it - Secrets from the Geneamommybloggers is by Jennifer Holik-Urban. My name is Jennifer Holik-Urban. I began genealogy research a little more than 15 years ago when I was finishing my history degree. One family project and I was hooked. It was my dream to become a professional genealogist. To write a book about the Czechs in Chicago and become known as an authority in some area of Chicago history. At that time I was considering the Czechs. Life happened and I had a child. Then more life happened and things changed. I was working full time and did my research when I had time in between working, commuting, taking care of the house and spending time with my family. 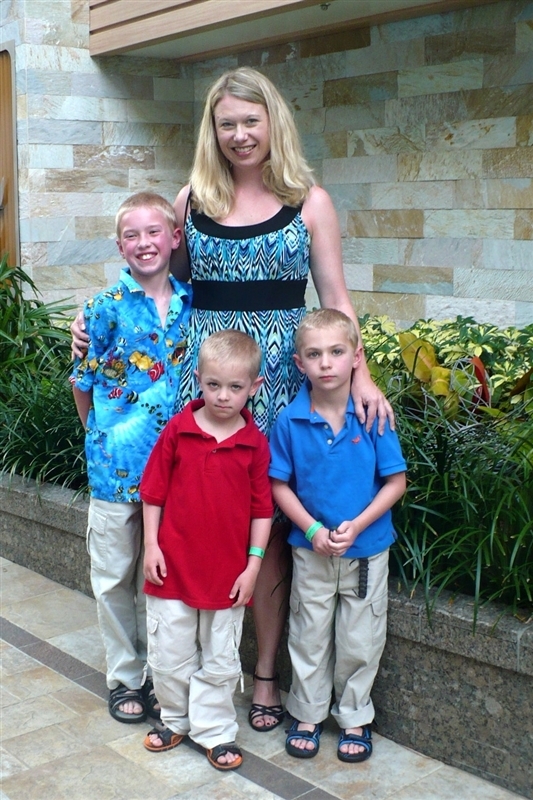 In 2005 I gave birth to twins and became a stay at home mom for my three boys. I was no longer working outside the house but became a volunteer for many organizations. The summer of 2010 I was inspired by a close friend to dust off my dreams and live my life a little more fully. Not to say being a mom isn’t fulfilling but there was another whole part of me that had been hidden away for a long time. I started my genealogy business and wrote a book about my cousin Robert Brouk. I published the book in January of this year. One of my goals from so long ago was met. The dream of running my own business was just getting off the ground. This year my boys are all in school full-time. I am still a stay at home mom but also have my business which has picked up since summer. My husband works at home almost every day so if I need to run into the city or be out with a client I do not usually have to worry about being home when they are home from school. This will soon change and I will have to be more available and shift my schedule. I probably do 98% of the cooking and 50% cleaning and laundry in the home. The boys have chores they do now which takes a lot of the housework burden off of me. I’m also teaching the oldest how to cook. The grocery shopping and errand running is kind of split right now but soon I will be doing it all and will have to fit it in preferably when I don’t have the boys with me. But shopping with them will have to be done also. I have multi-tasked forever it seems. Mom, friend, volunteer, genealogist, neighbor. Most of the moms I know do it all too. I started blogging in the summer of 2010 just before I started my business. Since that time I created four more blogs and I also write one for my local genealogy society. I recently took on a Social Media Genealogy Software client and write a blog for them also. I do all this while raising my kids. My oldest son just started blogging at school. His Literacy Enrichment class blogs about books they read. The school has a secure blog linked to other schools in the area and I think across the country to discuss books for their age group. If he enjoys it enough, I’ll set up a blog for him. Secure and private of course. Am I successful in what I do? For my personal research I think so. I may not work on it as much as I would like but I feel good about what I have accomplished and know that my boys are interested enough that they will continue the work later. My business is picking up in part I think because of social media. My blogs and writing on Examiner.com is getting my name out there. I’m meeting people on Twitter that are now passing my name along to others. Social media has not only helped my business grow a little but it has also put me in touch with researchers across the country I might not ever have known. I am able to pass potential clients on to others now that I have these connections. My average weekday looks like this. Wake up and get the boys off to school. Start my genealogy business work, whatever that entails. Could be visiting the city to research, going to the library nearby or working at home. I spend time writing articles to submit to genealogy journals. I also do volunteer work and all the mom duties spread out throughout the day. There are many times I think things are just too much to deal with but it has nothing to do with my business. More personal life. At these times I just focus on my big goals. Kids, business, stability and security. I try to find a way to keep on going and not let the other things get to me. I try to find ways to expand my business so I can give my boys the life I want to give them. When things get too crazy I remind myself to get to the gym. I have the bad habit of going consistently for months then stopping. Stress gets to me and then I just want to crawl under a rock. Then I start going to the gym again and remember that it helps me clear my head, relieve the stress and things are better. I try to eat relatively well, get some quiet time for myself, spend time with friends and family, and do non-genealogy things like scrapbooking and reading or touring around Chicago. Too much genealogy, whether for myself or clients is not good for me. I would like my children to remember that I was there for them growing up. That they were loved and well cared for. That their parents attended their school and extra-curricular functions and took them places and did things together. I want them to understand while there are and will be times when I need to work rather than play, that mom needs to have a life and goals just as they do. I want them to see me as a motivated, intelligent, interesting, and independent person. On a scale of one to ten, how obsessed am I with blogging? It varies between a 6 and 10 depending on how busy I am with the rest of my genealogy business and life. Some weeks I blog on all my blogs, several posts each. Other weeks only a couple of my blogs get attention. But that’s ok. Each blog has a purpose and it is supposed to be fun, not stressful. beginning October 15, 2011. If you missed a day, click here. I've just read all the blogs on this thread. What a great topic! I hope this series will inspire others to set achievable goals.